Energy efficiency is now one of the driving forces behind technology to reduce greenhouse emissions, carbon footprint and reduce costs. Consumption can be reduced at home or business by installing energy efficient lighting or installing control and automation systems. These measure can pay for themselves over a period of time in reduced energy costs. Voltage optimisation and regulator units stabilise and reduce the voltage coming into your property or business. Smaller units for domestic and light commercial use can save around 10% of your electrical consumption, some case studies have shown greater savings of up to 26%. With several units available on the market which can be installed next to your existing consumer unit with very little alteration to the wiring of your home or business premises. With pay back periods from 3 to 5 years and ever increasing energy prices, there has never been a better time to take the green option and plan for the future. The units come with 3 or 5 year warranties and life span expected is in excess of 25 years. Installing control devices to your heating, lighting and power circuits can also lower your consumption of energy. 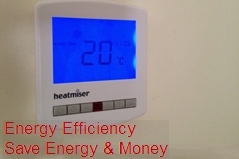 From installing a new room thermostat to your heating system where there was not one before can save £70 a year. Installing a hot water tank thermostat where there was not one installed before can save £30 a year. Installing a modern digital programmer offers multiple on/off times and adjustable temperature control will reduce gas consumption. Using automation systems, almost all electrical aspects at home and business can be controlled to reduce consumption, through sensor, timers and integrated systems. Advances in low energy and LED lighting has allowed for running costs to be reduced significantly. Depending on lighting already installed, the savings can be between 40% and 90% after LED lighting has been installed. Reduced running costs for lighting over longer periods due to lower electricity consumption. Extended lamp life between 25,000 and 50,000 hours – lamps do not need to be changed so frequently. Reduced costs for high level access equipment as lamps need changing less frequently. Lower maintenance costs through extended lamp life and no need for control gear that needs to be replaced from time to time. Reduced start up loads due to no need for energy hungry control gear. Reduced heat due to cooler running lamps and no control gear heating light fittings and wiring, reduced heat damage to lamp holder and wiring. LED lamps do not contain toxic chemicals that can cause pollution neither do they emit ultraviolet light. There is no need to replace light fittings as they can be modified for LED lamps. Halifax based electricians cover surrounding areas including Barkisland, Elland, Holywell Green, Sowerby Bridge, Ripponden, Huddersfield, Todmorden, Hebden Bridge, Mytholmroyd, Brighouse, Littleborough, Rochdale, Oldham, Manchester, Leeds. Bracknell based electricians cover surrounding areas including Wokingham, Winnersh, Ascot, Warfield, Crowthorne, Binfield, Winkfield, Sandhurst, Bagshot, Lightwater, Yateley, Twyford, Camberley, Chobham, Farnborough, Maidenhead, Aldermaston, Reading, Windsor.